a few weeks ago we presented our idea for our half day in London. At first, we would like to go to London Zoo. There are 18.499 animals with 752 species and a colony of 10.000 ants. The surface of the zoo is 15 hectares. Now we have a few areas and animals for you. There is a gorilla kingdom, an African bird safari, an aquarium, a butterfly paradise, blackburn pavilion, invertebrate animals, bats, komodo dragons, African animals, lemurs, land of the lions, meerkats, otters, penguin beach, hippos, a rainforest life area, a reptile house, a spiders area, a tiger territory, tortoises and monkeys. The entry costs is about 9 pounds. From the London Bridge Station to London zoo we have to drive with the Northern Line. We have to get out Camden Town station. It takes us 15 minutes to get there. An additional idea is the Sky Garden. 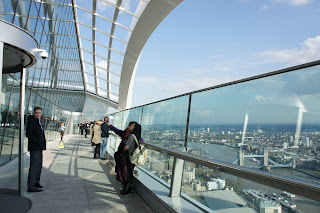 Sky Garden has free entry we just have to book it in advance. It’s a skyscraper where you can go to the top and have a 360 degrees view over London City. We can reach Sky Garden by foot in 15 minutes from the Tower Bridge or by bus. But we think it possible to go by foot. What did we do on Tuesday morning?